practically every major CPA network that I have applied to. by most of the networks you apply to. show ownership of your website before they’ll approve your application. to show them, this doesn't matter. about them, so you want to try out their offers. there is a short cut. and you're done. It gives you a great site that most networks "love". Last year, I tried this with Azoogle and I was approved in 24 hours! method to work, you need to get a domain name and get it hosted. (Edit: guys, the script doesn't work anymore to get you approved in 2010.
their message, find their phone number and call them immediately. approved as soon as possible so that you can send traffic. you’re planning to test some of those offers with your traffic. Tell them you’re a ppc marketer and you do direct to merchant pay per clicks. Have questions? Post here and I’ll try my best to help. This is a nice guide. Thanks for sharing. Read the forum rules! And STOP posting nonsense one-liners, before you lose your account. Great information! Could you also send me a copy for my site. I'm still learning all this and could use some help. This will help specially those who are unable to get accepted. The point here every body should understand is that CPA networks want to get quality traffic to their advertisers. So , if you want to get accepted by these networks persuade them that you will drive quality traffic to the offers . I think setting is wordpress blog and using a nice look theme is a lot easier . Originally Posted by Mike Morgan. Yes, WordPress works great. If you know how to create a WP blog....you don't need the script. This script is for those who can't set up a WordPress blog or just too lazy to create some content from scratch. It's an XML feed to create a list of products on your website. I just found this thread. I want to say thanks for sharing. Article marketing has been a staple diet for me. CPA marketing seems to be an ideal merge. Thanks for the tips and to all who chipped in. Really it's clear to all how to accepted on CPA networking. Good info for the newbies. Could you also send me the free script? I've sent you one. Anyone asking for my free script just pm me, I'll shoot you one. Don't have to post your request here, this way we won't have tons of clutter posts on this thread. Got you PM and will go get it now. Ooopp..!! Need to do some back linking for my sites too, right? P/s: I will be back to send you a 'thank' if the script is actually good and up to the task. Thanks for sharing this with everyone for free! Can u send me a free script as well? This is great info! Steven also has an excellent blog where he shares a lot of CPA info. The best IM forum I ever joined and earning money from..
Hay Bruce, can you send me the link to Steven's blog? Tried to find it, but didn't have any luck! I would greatly appreciate it if you can send me the script too. Thanks in advance. By the way, do you think the CPA networks will approve your application if your website is only a week old? Even if your site is a week old, they'll still approve you. Just follow through my steps and you'll be fine. hi! can i have a free script too? I am trying to gain acceptance into CPA networks as a non-US resident. Can you direct me to the W8-Ben form you mentioned? I have a very new site, less than a month old. Are you sure I do have a chance to get approval? Content: Bulk Article Writing Service $4/500 words!! Limited Spots!! Yes, a month old site is fine. Been there, done it. Here is how you fill up the W8-Ben form. Thanks a Million! I've been meaning to fill out several of these for other websites, but I never got around to it. Now I know what goes where. What is your favorite CPA Network? Wish I had your tips when I first started. I just stumbled into figuring these things out after a while. Creating an Affiliate Tools Page Couldn't Get Any Easier. Find out how. i pmed you about the site acceptance with cpa networks can i get some help? I looked at your site. It's a great site! You can show the networks. What you have is way better than mine when I started off. Just follow my steps (in my first post) and you shouldn't have problem getting approved. Thanks a ton for this guide. I'm calling up NVBA (NeverBlueAds) now, I'll tell you guys about my progress! can u please send me the script? peewoa and creativecommons20, I've sent you guys the script. Very nice post. Thanks for the info. Can you also please send me the script. Ran out of pm's to use. A group of us newbies have been discussing situations where one or more of them have been having difficulty getting approved by eBay, have you heard that eBay is getting more selective? I'd like to have a copy of the script too, Steven. And by the way, what's the link to your blog? it'll be filled with invaluable infos on CPA. that everyon can gain from it too. i have to fill the W-8BEN form after being approved by the networks? where the checks sh'ld be sent. Did i make myself clear on this issue at all? If you don't have a US Social Security Number, you need to fill up W8-Ben. As long as you're not a US resident (even though you use a virtual address, it doesn't help you), they need the form. Guys, I've sent you the script. I don't have the min posts up yet to PM you, can you send me the script for the website? Sorry for the junk post! Announcing: The first network of its kind! 100% direct. Exclusive. Dating ONLY offers. Can you send me the script? Thank! I don't have anything to promote here - why don't you just friend me on Facebook instead? Hi, can you send me the free script also? Thanks a bunch. Have a great day. Thanks... I've signed up but I can't find anything called SGS package... Can you help? on how to install it for those of us that are non-techy. Yes, you need to sign up to get it. It's free to sign up. Don't know how to do it? They've support to help you. Find the link and seek help. It's free too. nice post. but if i cant speak English. how can i get accepted by cpa network? is any other way to help me? As long as you can speak simple English you're good. No worry, they're only asking a few simple questions to get you approved. Its very simple just read the question in singup forum carefully and submit answer.You must be got knowledge about affiliate marketing also.its will be helpful for you to become an affiliate. please send me this free script. thanks! show ownership of your website before they'll approve your application. and address--so that we can verify ownership....."
manager to get me approved"
you're planning to test some of those offers with your traffic. Tell them you're a ppc marketer and you do direct to merchant pay per clicks. email requesting some information before they will approve your application. If you need help, post it here. I'll help you with those questions. networks. If you need help to fill it up, let me know. It is great to stumble on your post. Thank you for your in depth analysis to the issue of getting approval from Cpa Networks. However, as you said i will be contacting you soon. Could you please make it more understandable when you say pm me. [New WSO..Starting at $2] How I made $3,724.11 Under 2 Hours. I am a newbie PPC Markerter and new to Warrior Forum, with keen interest in CPA networks. I read your post on how to get approved by CPA networks, I would like the free script for the website. I do have a domain name and hosting account ready. I will also need additional help with filling out the questionaire when the moment comes, as well as the W8-Ben form as I am a non-US resident. Kindly, list me for the step-by-step coaching on how to make $100/day. You are a superstar and I look forward to learning a lot from you. Please PM me your response. Yes, non US residence needs to complete a W8-Ben form and submit to the networks. I've completed a sample here showing you how to fill the form. Warriors, I've sent out the script to all. Let me know if you still don't receive. i dont have a registered company yet.cos i think the question applies to company reg number or something like that and i dont have ss# cos am not in the us. what can i do, expecting replies asap.thanks. That's Social Security Number for US. If you're non US, fill in your local tax number. They'll except it. i want script . plz give me . yup, i used ppc direct linking, and didnt have any issues. Yes, they don't mind direct linking traffic. If you don't have a decent site, tell them you're sending traffic direct. It works. Steven can you send me a copy of the script please? Thanks for your info, much appreciated. From what I've been reading up, it seems that if you have a semi decent website, you should be ok to join, would that be right ? Only reason I'm asking is because I've started a blog a few weeks ago and used that when I applied to a couple of CPA networks (about 10mins ago). From what I've been reading up, it seems that if you have a semi decent website, you should be ok to join, would that be right ? That's right. With a semi decent site you should be good to get accepted. Remember, CPA networks need affiliates the same way we need them. pls sir can u send me the script cas i cant pm u for now. Thanks,Stevelean, that is very helpful to me. can you send me the script? i cant sent pm.thank you. can you send me the script? ideasuniversity, alexan, charlieman999, I've sent you. Another newbie here. Thanks for the great info. Can you send me the script too. I've sent you the script. Thank you for posting this. Very informative and I like that you are charging people for this information. I'm new to CPA and will put your tactics, along with others I found on WF to use. Can i have the free script as well?I'm thinking of CPA as my next step to online business but i also heard it's a bit hard to get approve.I will be glad lo hear a successful story. Thanks for the procedure.I'm just having a problem in building a website to present the network.I'm not good in designing and creating my own site.Can you help me with this? Got into my first CPA network today after having read this thread. Still waiting for calls from 2 other networks. I kind of hate talking to people I don't know on the phone, but with the info in this thread it was no biggie. Anyhow, thanks a lot Steven. another great tip to add to the script is to do a follow up call yourself. that lets the network know that you are not a bot or spammer. It shows you have true interest in getting in their network. Don't wait for them to call, pick up the phone yourself. and don't use the call phone? Great Post and it is very helpful especially for a newbie like me. Can you give me the script too. It simply means 'private message' - you can contact people that way to ask questions of a more confidential nature once you've made 50 posts. Dealing with a subject on the forum risks revealing information which perhaps should remain private. If you have fewer posts and wish to ask such a question, state it in a post; usually you'll get an e-mail address. i have a web site but it have a long time i didn't make effort about it, if they see my site they will know that i have not a lot of visitors? Hi @stevenlean , can you you om me the script for the making personal site. With all the post Ive read here I'm becoming more interested with CPA. steven, Can you please send me the script too? I need your free script. Pls can I use a domain with a .info extension? Please some one help can i use a domain that ends with .info ? Can you send me the script also on PM because i can't send you a PM yet..
One more added thing, that I have found works. Usually on the application they will ask you how much you usually make. I usually put $5,000 to $8,000 a month depending on what you are promoting... Anybody just starting out if you want to get accepted you just have to put this even if you don't. They are picky and want real marketers on their networks pushing traffic. If you want to get started you have to bend the truth a little I have found. Ohh, and write down all your answers on the app before you call so you can reference what you put down. Because they will ask you on the phone pretty much what you put on the app. So sound like you have been around the block a few times. They will also ask you how you got started, and will want you to talk about yourself to see. So rehearse like crazy just before you call so its fresh in your mind. I was nervous the first couple of times on the phone with reps, but got accepted to every one I applied to. Want An Injection Of Fast Cash? Download The Free Fast Cash Secrets Report Then Now. I've read your blog..interesting! .. Thanks so much for the script Steven. Got the script thanks a lot Steven. If there is something else you need to do for the Thank you as per your PM to me let me know. Otherwise Thanks again..
Read your website, 100adaymethod.com. Very Informative. Valuable directions, Steven! A true "missing link" for many of us. Thanks! Please send me the script you mentioned. You need proper English on your site. I was like reading "Chinese" on your blog. LOL.......I suggest getting your articles proof read before posting them on your blog. Don't be shy, just give them a call and tell them how you plan to promote their offers. Once you know what they want to hear, its not hard to get into CPA networks. Best of luck. "Discover How A 20-Year Old "Average" Dude Is Making Over 5,500$ Per Month on 100% Autopilot!!!" I really liked your information. I'm about to start in this segment and I need all the help I can get to brake the ice. I know this thread is quite old but I was sent here by someone who knows a lot about affiliate marketing and I new at it.. trying to get accepted by a CPA network and he suggested I contact you on this thread. Could you please send me your quick trick for getting a site up for CPA approval. I just bought a WSO on CPA marketing and it directed me here as well. I joined 3 today and was accepted by all (one denied me before I had a chance to call) I took the advice to call the affiliate manager on my application to introduce myself. I told them I'd be using PPC and SEO to drive traffic and that was good enough for them. One asked more about a couple of my niches. I explained them and asked if she had offers to recommend. Once I asked that, she saw my interest and approved the application. I called the one that denied me. they just wanted to know how I would be promoting the offers. Once again, I just said PPC and SEO. I just started this yesterday and followed the advice to call the affiliate managers. It worked. Tired of Chasing Shiny Objects? can you please send me s script? I have applied for neverblue for CPA offer but my application got rejected. I am using wordpress site and I am from INDIA. Can you please send me the script. This is great, I was going to PM you, but I am new to this IM thing, and I can not send PM until 15 post´s, Please send me the script. You don't have to be a US resident to be able to get approved by CPA networks. Though a few networks like Azoogle only approves residents from US (and a few other countries like CA, UK, AUS etc...), you can skip these. Apply with other networks. There are tons of network around. Can i have the script as well..i'll owe u one..thanks! Well I can not locate the script, any help ? Can't PM anyone yet...could you please send the script to me? Thanks, and sorry for taking up forum space. No problem, I can understand. I've sent you the script. Got the PM with script info, Thanks! Thanks for a great idea! A great time saver. Laurencemillionaire, you've a great tip there! You method definitely helps to one get accepted to Networks faster. Thanks.. its so simple but nobody shares it! Hey lauren, can u give me the link to the blogs u mention? So far i can only find blogs with Hydra's ad. Grab this FREE report while it's still available. Hey, Steven can you send me the script too please? Click here to cut electricity costs today! Learn how to reduce them here. Doug, I've sent you the script. can you send me the free script ? thank you. Thank you! Steven, you're a nice guy. this is really really really great! pure solid gold for anyone try to get accepted into CPA network. This is an awesome share. Can you please send me the script as i am not able to send a pm. Can I still get in on your very generous coaching offer? This is so generous of you to share. I've sent you a PM. Thanks for this opportunity! Guys, I've sent out the script to all. can i have the scripts too? Hi Stephen! Can you please send over the script? I've seen that advice to "call the networks first" before, and good luck if you think you'll be ringing your aff manager straight away. An example: I applied to marketleverage, and called them within 24 hours - get a general voicemail so I leave a message. A couple days pass and no response, so I got on AIM and chat with one of their aff managers, who says she'll forward my message to someone who'll get back to me. About a week later, I finally get a call from someone who's able to approve me. Note that this isn't your affiliate manager, just someone who cases new publishers. I had almost the same exact experience with Neverblue. Hi Steve, I don't have enough post to PM yet. Please send me the script as well. Btw, I'm also from Malaysia. Currently residing in Puchong. How can i contact you? Could you send me the scripts. Thanks! Hey Steve can you pm me the script if possible? Would you please give me the script? Steven - great info, and thank you for sharing this! Don't Be A Hackers Victim - Secure Your Wordpress Website Now! Not sure the best path to take? Which security plugins are best that won't break your site? Confused about configuring the plugins properly? Don't want to DIY? I'll secure it for you @ a reasonable rate, including backups. Click Here! I've sent out the script to all. Here Is A Simple Step-By-Step Solution To Make Cash. Just Set And Profit! This is really great information. I'm getting more and more into the CPA movement..
the help and the support you provide. I'm about to apply for CPA network too... but i did't have a Site. Can you send me the script too. P.S: I can't send no PM since this is my 3rd post. Can I also get the script. It's nice to see someone tackle this with a straight forward, no "secret sauce" type of approach. For readers... follow this advice and you WILL get approved. Thanks for all this helpful info Steven. I will be applying and see what happens. can I get the script too? could you send me the script please?? Can i have the script too please? You are as good as the tools you use are!!! I CAN FUND YOUR IDEA IF I LIKE IT!!! Can I please have the script too? It would be greatly appreciated. the problem with this and why it really is not going to work is because fraud affiliate read this post and now they are saying word for word what you tell them - and when i say did you read this on WF they of course say no. Bottom line all you need to do to get into any CPA network is be a "real" affiliate. Yup i said it. We don't really care what site you have, and half this other crap. So the best thing you can do is be honest tell us what you are doing - if you get no traffic and you are just starting tell us that - chances are we will give you a shot - but lie and we figure it out. I suspect many of the affiliates that are having trouble getting into network are having trouble b/c they are not real affiliate marketers. If i'm wrong about that, then this is a case of good pubs not getting into good networks and that is a bad deal- after all Networks need the affiliate so if that is the case well a few bad apples are messing this whole thing up. Most affiliates are honest and really trying to work hard through legit methods. I agree there are always bad apples around. I'm pretty sure networks like you have the system in place to protect the interest of all parties involved in the business. I'm giving people a method so that they get to start some where. When they get approved, they have to prove themselves to be a "real affiliate", else they won't be staying long in the industry. But affiliate networks should be more accepting to international affiliates. I hate it when I get rejected because I don't live in the USA. well some networks are now not allowing non-us because of so much fraud. If you are legit and just happen to be non-us - then call the networks and explain how you market - they will let you in if you are real and can drive traffic. Could you pm me the script as well, thanks! Would you like to know how to get customers from Facebook? Click here for a free report.Want a free video tutorial on using Google Places and how to set up your business for free, click here. Thanks for the great info. I'm very new on this forum and can't pm you. Kindly send me the script too. Thx!! Good info, as usual. You're a prince. Can you send me the script, too? Warriors, motivebrendan has a point there. One day, this script-generated site will definitely get saturated. CPA networks will notice there is too many applications with exactly same site designs. When that happen, your application will not go through. Create a WordPress site with some PLR content on it. Buy some PLR content on niche like financial, health, education, insurance etc. CPA networks love those topic, most likely they'll approve you. Though this cost you a little work and money, but you'll get a unique site for CPA application. Thank you for your advice ... it was very well thought out ... I am also new to this forum, so I can't PM you, but would also like a copy of this script. Max, I've sent you one. I wanna try this one out. I just signed up here so I can't send a PM yet. Can you PM the link to me instead? GOOD PLEASE I AM INTERESTED IN YOUR WEBSITE SCRIPT DESIGNER. GOOD PLEASE I AM INTERESTED IN YOUR WEBSITE SCRIPT PLEASE IT TO ME . Hey Steve as always you are always on the money when comes giving quality values to fellow Warriors. I do believe also that calling the networks 24-48 hours after you send in your form is very vital. It always works for me. That shows that you are interested and ready to bring something to the table. "WARNING" The Truth About 100% Commission Programs You Are Not Being TOLD. CLick Here To Get It! Oh yes, calling them is important. They want to know they're dealing with someone who's serious. I used to call them in the morning.... just to make sure I'll get them when they step into the office. Hi Steven, can I get your free script too? I just began signing up for CPA networks today, and read here that it you could just basically submit any old site that you have. Would a personal blog be sufficient?? It's not in a niche, so I'm wondering if that was a bad idea. I did mention that I do PPC, which is why I don't concentrate on websites. Can you send me a copy of the script also! I'm also interested in your free script. Could you forward to me? Guys, I've sent out the script. Let me know if you still don't receive. You can send me the script too. Hi Stevenlean any chance of you sending me a link for the website script. Thanks for the advice...very timely. This is the exact issue I'm encountering at the moment. Be that as it may, I'd also like to see your script....please send. Thank You stevenlean I have received the script as promised. I've had no problem getting in; just be proactive and call because they won't call you, and sound convincing on the phone. I call a day after I sign up with anyone. I received the script, Steve, but I'm having a problem with the poll WSO I purchased from you earlier today. Because I'm too new, I can't post the transaction ID to the WSO thread, and thus can't get the link. Thoughts, suggestions? All networks want to get quality affiliates to provide quality traffic to the advertisers, but the difficulty in most approval processes comes from not quality or quantity, but in fraud. The numbers of people who sign up accounts with the intent to send either stolen traffic (PPC purchased with stolen credit cards) or flat out fraudulent transactions submitted as leads is absolutely staggering. Networks like us are now being bombarded by "legit" publishers who are based in the US, but are being paid by people overseas to get though the approval process and "sell" there publisher account. Networks have to spend more and more resources, or simple not allow general outside applications, and all this, in the end, costs the publishers money as the more the networks have to spend on fraud prevention, the less we have to pass on to the publishers. Thank you for the data! Very well explained. Good job doing this guide. It seems like you need to call them although they say they'll call you - games people play...If you can get accepted in Linkshare and shareasale with no fuss, can't see the reason for the CPA networks to be so careful and demanding! That's very nice of you to give so much good info. Even some ebooks on cpa do not cover this topic in details like you have done here. Guys, I've sent it over. can you send me one too. Thanks for the contribution to forum. I'm new to the warrior forum and can't PM yet. I have find your info on CPA very educational...I'm also interested in your script. Could you please send me the script? Thanks a bunch! thanks for the good Information. I'm also a newbie in the CPA Market. Can you send me your script too? Do you work as Corporation or as a single Person in this Marketing-Business? Is there anything you can say about what is better? I want to start this as a Fulltime-Business and am not sure if it is better to incorporate maybe offshore or in the us. I'm not a US-resident. No Problem, glad to throw in my 2 cents. How many banner impressions do you serve on a monthly basis? How many visitors do you get on a monthly basis? What kind of advertising do you use? Are you interested in banner rotation? Do you currently use ad rotating software? If yes, which software do you use? What is your average eCPM? Steve, can you please send me the script? HI Steven, I'm a Malaysian too and I really inspired by your success in CPA. Steven, I applied several CPA networks but didn't receive any replies from them after 1 week of time. So I think they might reject my application silently. So I suspect that the web site(it is my blog) that I used might giving the problem. Do you think that I should start a new site purposely for the applications? pm me your site URL, I can tell if they like your site. If they can't reach you (you missed their call etc..), they won't accept your application. I suggest you give them a call. I called every network that I applied to. Steven, my blog url just inside my signature. the problem is I never receive any calls from them. Maybe I should call them. How to call them from Malaysia here? Any guides for me? Your site looks good. You shouldn't have problem with it. Get the networks' phone number, Google up the international call code and call them up. I use Maxis service, the rate is only 20 cents per minute. Check to see if they accept applicants out of the US. That might be the reason you have not heard anything. Yeah, some of them do not accept Malaysian. But I failed to apply those do accept. Anyway thanks for reply, will try Steven's method and see I have any luck on this. Thanks for your helps, Steven. Will call them next Tuesday (Local time here) as I think they might off in weekend. I think USA and Malaysia is different 12-14 hours. Steven, what time you call them up last time? I mean for +8 Time zone. What kind of questions they usually ask? I quite nervous to call oversea and talk to foreigners.... So I wish to prepare myself for the questions and answers before I make any calls. Be honest and dont be a fraudster. That usually gets you in right away. CPA Affiliate Network with top payouts! I think its always better to give them a call by our own, after sending them out application. It works out really well, aim chat also worked out well. Can I get a copy of the script. I can't pm because I haven't left another msgs yet. I'm a non US resident. Where can I find W8-Ben form? You'll be able to download W8 form from CPA networks website. Some AM will email you the form. If you can't find one, ask your affiliate manager to send it over. Your writing is very clear and easy to understand. Do you have your own email list to tell us about your next $100 a day ideas? Thanks Steve, I fall into the catergoey of not knowing how to setup a blog. Could you please send me the info on obtaining the script? Long term you are better off with a blog. WordPress Blogs are not difficult to set up once you see what to do step by step. Terry Dean offers camtasia videos that tell you what you need to know at Blogging for Fun and Profit. please...a new bie here again, I need the script. Steven, Your tips are cool! After reading your tips and take action, finally I was accepted into 3 CPA networks! Thank you so much, your tips definitely great! Glad to know my tips is helpful. Thanks for your great tips, please send me the script. Could you also send me the script to new to be able to PM. Please send me the free scripts and such. Hi - thanks so much for the helpful guide. I am working to get on with as many networks as I can then send my traffic to the zip submits and such. Do you think that I would make money if I put together a guide on how I got them on my list and how they are willing to constantly do CPA offers? I was worried that it would be an infraction of one of my CPA networks to make the guide and sold it. If you know how to structure your marketing campaign well, selling a small report at $17 to $27 range can make you a fortune over time. The problem is, most ebook marketer don't have a clue how to run a sustainable campaign that last long (months to years...depend on the book's content). They make some small money from WSO and that's the end of the story. Great info, I also had problems getting into CPA networks because they have a old way of thinking that you need a website where you can put banners on instead of PPC direct linking. Thanks for the script and the advice on my book. I got started writing it tonight since I couldn't sleep. I'll send you a review copy when its ready. Could I get a copy of that script to Steve? Glad there is something to get begginers started with CPA. If you need wordpress themes customization, please PM me. Just wanted to say thanks for all the free information you give here and on your blog. You convinced me to try CPA. I really appreciate the help, and look forward to working with you soon. I am unable to PM. Can I get a copy of the script? to pm you......is it possible to pm me? Hi Steven, can you please pm me the script as well? I can't pm you yet. have it all covered Steven. i tried to apply neverblue yesterday, i called them up immediately, answered their questions with the answer steve suggested. The website i show them is one of my site which promote physical products on amazon, and it looks like they dont like that. They want me to show them a site with CPA, so that is why I got denied. I have a weight lost site and I am thinking I should just set it up with some CPA offer for weight lost and then I can start to apply other networks. Does it work? - tell them how you intend to promote their offers (write simething like this: " I am an expert in online marketing with over 4 years experience. I have launched several successful campaigns and I use a range of marketing methods article marketing, social networking on facebook myspace and youtube to drive a considerable number of targeted buyers to my websites. - use your domain email (mail@yourdomain.com), avoid free email services because it is obvious that a professional internet marketer will not use a free email service. This really matters because I have noticed that I got rejected when I use a free email service then get accepted after reapplying with my domain email. I recommend you to start with pepperjam because it easier to get accepted and you are paid twice a month with hundreds of great offers. if i already have a weight lost niche blog which is under my own domain as well, and i have some fitness article in there, is that good enough? Should I try to promote some CPA offer i can find on CommissionJunction so that can increase my chance better? @ vinlulvie - yea, that's not a bad idea. @ henry cu - I've sent it over. I still have trouble in it . Hi Steven, Can I get a copy of that script too? Seems I should speak up a little more often, here in the forum. Great thead, I'll go back to where I left off.....page 2. Deeply thankful for the info. sorry i don't understand with this word " unpack it on your server and run install.php"
1. FTP the files to your server. do you know the messenger accounts of the different cpa networks? perhaps we could send the affiliate manager a message that he approves our account without telephone verification? Thanks for the CPA-Passport great stuff. Is your CPA coaching course closed? Please send me the script. Thanks. Great info - I have never been denied - but I do it the old fasshion way. Was lookinf for a quick way to expand - your information helps. Can you pls send me the script please, I cant pm yet. I am new to CPA and am about to apply to my first network. Any suggestions? I plan on creating a site to show them (i am quite familiar with wordpress) however i don't know what to put on this site??? What should this site look like? Let's build a website you are excited to show off! Buy some PLR content for your WP blog. Networks have tons of offers in niches like dating, weight loss, education, payday loan, car insurance, most financial niche. Find PLR articles for any of those niche, set up a blog with 20-30 posts and start sending in your applications. Great tips for those looking to start affiliate marketing. pls send the free script to me as well. Thanks in advance. So much great information! I would love the script, as well. I had bookmarked this thread some weeks ago and for some reason couldn't find it until today. I wanted to come back to it the morning after I read through all the post to order your information as well as get your coaching. I read the post on the last two pages upon finding it again and have noticed in one of the post that you no longer offer the coaching. Is there any possible way that you think you can make an exception. I can understand if you don't but if I don't ask the question, I would never know the answer, right. Either way, I'll respect whatever answer you leave with me. Also, can I get the script. Would really appreciate if you can send it to me too. Creative business ideas to make money online. Unique opportunity to work from home. There is just one thing which is commonly aasked by all networks and that is , how will you promote them? You answer this right, they will ask you one or two more question regarding it and then you are done. This is mostly what i had been asked till date. I am a newbie too and not confident to sign up at the beginning as well. So I emailed the author (He lives outside of the U.S. too) of the ebook that I purchased and asked him for referral information. I got accepted! It's just not as difficult as we imagine. Good Luck and I am sure that Steven's method works! Thanks for the info Steven! I will be trying this when I start CPA. Could you send me the script? I'm not at the PM post limit yet? Thanks. Please send me the script. thank you for share! It really useful! Great guide Steven. I've had some fellow IMers who've had trouble getting accepted into CPA networks ask me how I've gotten accepted and I gave similar responses to your post. There really is no magic behind it. Just show them that you're genuine and serious about it and they'll give you a shot. Could you pm me the script you were talking about, I'd like to be able to give it to friends if they ask me as well. Thanks again for this great post. LEARN the secrets firsthand from a self-made internet millionaire. First, find someone with a few CPA networks, tell him your plan to sign up with a few CPA network through their affiliate link so that they get paid. Be honest and open, build up relationship, tell him you're having difficulty getting approved and you need a little help. Get him to pass you his affiliate manager's IM (most affilite managers use AIM), you need to contact their AM for fast approval. AIM each affiliate manager, tell them you're already with a few other networks and your friend John said something good about them, and you want to try their offers out. After sending in your application, give them a call and you should be approved immediately. I've sent the script over. elevationz, hugeaffiliatecash, awagan, and Joe Blitzer, I've sent the script over to each one of you. Thanks for the response Steven. I got the script and will sign up and let you and the warriors who are following this thread know how things turn out. i am a non US resident and want to get into CPA networks and i have no idea what a W8-Ben form is , where to get one , how to fill it and how to send it . could you please help me with that. i am a total newbie to this. thank you. CPA network will send you one when you've signed up. 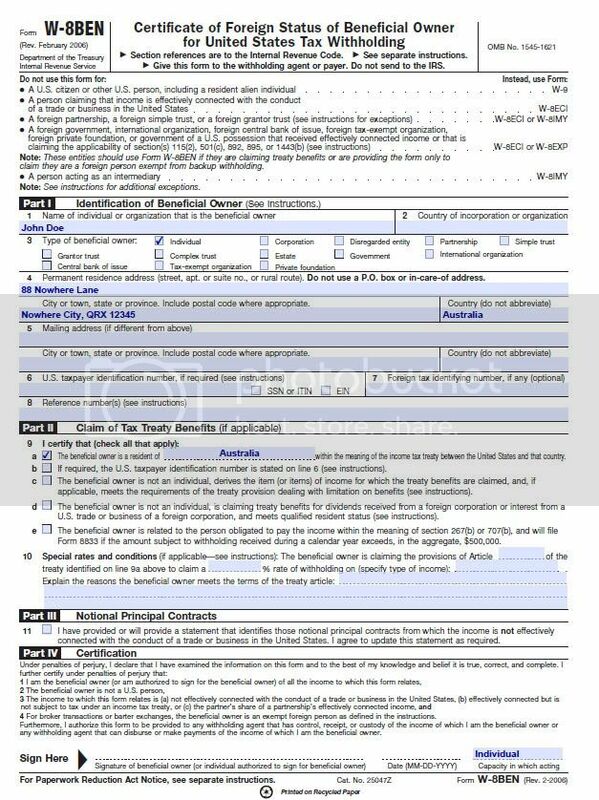 It's a form that says you're not subject to US withholding taxes and why (not resident in the US). Hi! Great info you've posted! I have been into CPA for months now and always appreciate these kinds of guides. Thanks added. Great tips bro. I love to well thought out posts like this. Hey Steven, I hope you don't mind to send me the script as well. Here's a quick update. Signed up for Azoogle and called them up shortly after submitting the application. After studying the information that you and others have provided and answering questions as though I really know what I'm talking about, the affiliate manager quickly pushed the application through and accepted me. Also signed up with Neverblue but will have to call them in the morning. The plan is to first sign up with 7 -10 networks and then go to the next step. I think the steps I'm taking are baby steps but at least I'm taking some steps. Thanks for all your advice Steven. The Easiest Way to Make Money with Affiliate Marketing. Earn $2-$3 Per Person Per Month in Residual Income By Giving Away FREE Shopping Software That Saves People Time and Money. How Many Can You Give Away? 1,000, 10,000, 20,000? can u send me the script. i cant pm cos my number of post hasnt reached 15. Any manual for W8-Ben form for non US residents? Can you list here CPA's that allow asians? Thanks a lot! You don't need a manual for filling up a W8-Ben form, just follow this sample and you're good to go. Great advice in this post. Ive been doing CPA networks for 9 months now and have been approved by over 15 networks. I got approved by 10 as a complete newbie. My best advice. Just be confident and talk the talk. Even if you have to name drop a bit . Cpa networks do not like newbies and if you sound like one, forget about getting approved. Familiarize yourself with PPC speak, which you all should no from this forum and you will be ok. There are a couple of networks out there were you do not require a phone interview. Hi Steve, Please kindly send me the free script. Are there any ways to get accepted into any CPA networks without a phone call? The other best way is intant message. Most of the AM's use that and they can quickly reply to you, so just add them. I totally agree with the outline written, and in fact have pretty much used the same methods in the past myself. Follow what is written, but just as important, be confident when approaching these CPA networks and you should be fine. After all, why should they refuse quality traffic? They need to make their share too! This is the great post. I am new and non us resident. It is very hard to get accept as we all know. By the way, please send me the script. I could not p.m. you as this is my first post. Mostly i look information in my own language. However, i will continue to follow your step. Hope it will work for me too. Thanks for all of this great information. I will be using it soon and hopefully it proves to work as well as stated.